The speaker that has it all! 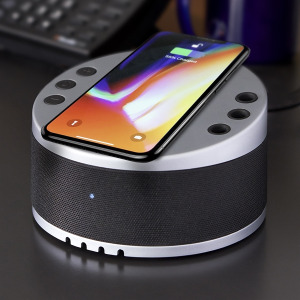 The LYNQ is a wireless speaker with conference call ability, 4 port USB data and charging hub, wireless charging station, 3 hole pen and stylus holder, and there is a cable organizer built in to the bottom. Product size: 5.875" x 3.375" x 5.875". I'm interested in learning about the LYNQ. Please contact me.